Mitchell Gibson’s 37-save shutout of the United States Hockey League’s leading offense Saturday night was the Central Illinois Flying Aces goalie’s latest strong effort in March. Gibson is helping the Flying Aces keep playoff hopes alive. His shutout came in a 4-0 victory over the Eastern Conference-leading Muskegon Lumberjacks. The 37-save effort was the second in a row for Gibson, who also led a 3-1 win over the Madison Capitols Friday night. Gibson, a fourth-round 2018 Washington Capitals draft pick from Phoenixville, Pennsylvania, is 4-1 with a 1.60 goals against average and .953 save percentage in March. The NHL Entry Draft selection came following a 2017-18 season with the Lone Star Brahmas in which Gibson was the North American Hockey League’s Rookie of the Year and Goaltender of the Year. He posted a 1.59 goals against average and .935 save percentage in 35 games last season. EHL PLAYOFFS: The Vermont Lumberjacks, Boston Junior Rangers, Wilkes-Barre/Scranton Knights and Philadelphia Revolution advanced in the Eastern Hockey League playoffs with first-round victories in two-game sweeps. Vermont swept the Connecticut RoughRiders, following up a 5-4 overtime victory Friday night with a 7-3 win Saturday morning. James Boivert had a hat trick in Friday’s game. Boston also had an overtime win and a regulation win while sweeping the Seahawks Hockey Club. Billy Girard stopped 74 of 77 shots while Connor Galloway scored three times, including an overtime game-winner. Hunter Bersani scored three goals, including the game-winner in Game 2, as Wilkes-Barre/Scranton avenged a loss in the same round last season by sweeping New York Applecore. The Revolution got past the Philadelphia Junior Flyers and now face another Philadelphia opponent in the Little Flyers, who had a first-round bye. The New Jersey 87s, New Hampshire Avalanche and East Coast Wizards also had byes into the best-of-three second-round series, which began Thursday afternoon. 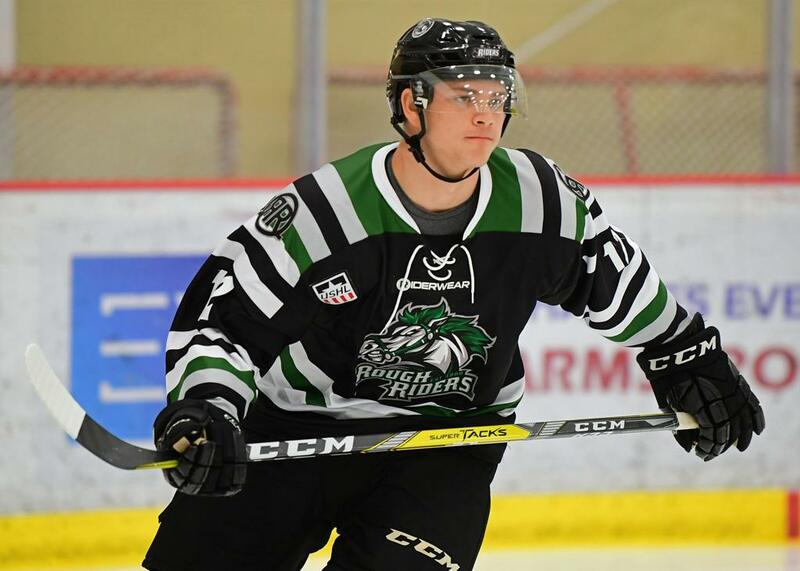 NA3HL RECAP: Brady Lindauer and Brandon Ratzloff scored two goals each as the Coulee Region Chill clinched the North American 3 Hockey League Central Division title on the final day of the regular season when they defeated the Wisconsin Whalers Saturday, 7-2. The Helena Bighorns clinched the Frontier Division Friday. Other division champions were: Coastal, Lewiston/Auburn Nordiques; Northeast, Binghamton Junior Senators; South, Texas Brahmas; and West, Granite City Lumberjacks. The NA3HL moved into its Fraser Cup Playoffs Thursday with the start of best-of-three division semifinals. PLAYOFF CLINCHERS: The Fairbanks Ice Dogs and Jamestown Rebels each clinched North American Hockey League playoff berths with Friday victories. Fairbanks moved into a tie for the Midwest Division lead with the Minnesota Magicians by defeating them, 2-1. Matthias School made 31 saves and Tanner Edwards scored the game-winning goal early in the third period. Connor Linton had a goal and two assists to lead Jamestown past the New Jersey Titans. Niki Jasko scored twice and the Rebels allowed just 14 shots on goal. Jamestown is 31-13-5-3 and second only to the Johnstown Tomahawks in the East Division. The Tomahawks (44-7-2-1) have already clinched the title. ONE-TIMERS: USA Hockey National Team Development Program Under-18 forward Jack Hughes has scored in five straight USHL games, including three goals and two assists in a weekend split with the Lincoln Stars, giving him seven goals in those five games. … The Youngstown Phantoms have won five of their last six USHL games. … Samir Abouelhana from the Philadelphia Revolution led the EHL in regular-season scoring with 93 points in 44 games and is tied for the lead after one round of the playoffs with five points in two games. … Minot Minotauros goalie Nicholas Grabko stopped 67 of 69 shots in a pair of NAHL wins to extend personal and team winning streaks to four games.